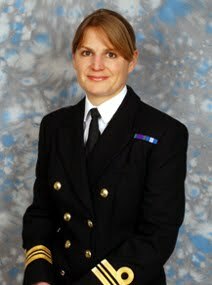 Yet 25 years later, a woman just four years my junior, Lt-Cdr Sarah West, is poised to take control of HMS Portland. She will become the first woman warship commander in the Navy’s 500-year history, although a succession of infamous female pirates, such as Lady Killigrew and Grace O’Malley, have demonstrated an equally long tradition of women making gifted seafarers and strategists. -- Rowan Pelling (left), mentioning IntLawGrrls' foremother O'Malley in a London Telegraph column cheering the news of the trail-blazing naval appointment, effective next April, of West (above right) (credit), who holds a degree in law as well as in other subjects. First permitted to go to sea as part of the Royal Navy in 1990, women now comprise 15%-20% of crews. But they're still excluded "from posts in the Royal Marine Commandos, mine clearance involving diving, and" -- unlike their American counterparts -- "submarines." Women "gifted seafarers and strategists" include Bouboulina, for whom the shipping company I once worked for in Greece was named. Heroine of the Greek war of independence against Ottoman rule, she both funded and commanded a fleet of ships to one victory after another. Bouboulina Shipping, S.A., for which I worked in the late 1970s, was owned and run by a woman -- highly unusual now, and even more unusual then. Her head of accounts was a woman (mind like a steel trap), her head of legal was a woman (brilliant strategist). The Operations Department was all men. The office dynamics were fascinating. The owner has since been quite involved in the Women's International Shipping & Trading Assocation (WISTA): "an international organization for women in management positions involved in maritime transportation business and related trades worldwide. WISTA aims to be a major player in attracting more women to the industry and in supporting women in management positions."